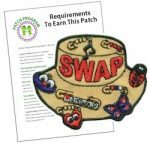 Your troop can whip up these crafts for swapping in no time and have really nice pins to trade. Cut satin cord into 11″ lengths. Fold in half and half hitch to a safety pin by placing the folded end down through the pin and drawing the cord ends down through the folded end loop. Diagram at right shows how a key ring will look with cord half hitched to it. String one cord through an “I” bead and a “Heart” bead (or the J and R beads). String the other cord through the same beads in the opposite direction. Repeat with the next row of beads. String both cords through a heart bead. Tie an overhand knot underneath the heart bead. Trim. If you are using optional SWAP* tags, write your message on the tag and slide onto the pin. Close pin. 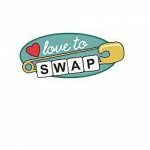 14 reviews for "I Love GS Kit for Swapping"
The scouts enjoyed making the “I Love GS” SWAPS. Though a little difficult at first for the 4th and 5th graders they managed to master the skill of adding the beads correctly. Great SWAP! Easy for my Juniors to put together and was liked by all who received it. 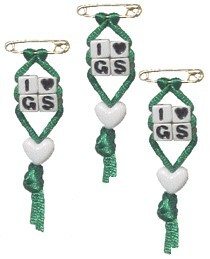 We bought these to make as swag for geocaching. It was nice to make something representative of our Junior troop. Very easy and quick swap to make. Everything we needed was packaged nicely and saved us the trouble of having to buy all the separate pieces. We used these as a craft at our annual Powder Puff Derby. Everyone lived them. My only comment would be the ink in the cube heads was very inconsistent and, in mist cases, was very light. They were easy to make and cute! I haven’t used it with the girls yet. Our encampment is Sept 21 and the girls will make the pins then. But I have made a sample and prepared everything. My daughter brought the pins to swap at the bridging ceremony to The Next Generation of GS in Orlando and the girls and parents liked it very much. What I liked about it is that it was very easy to make! Like the idea of making a kit with this theme–we will use these this summer at our day camp. Price is right too. The packaging worked well for making swaps. Beads and string were good quality. Beads were neatly separated, and instructions easy to follow. Girls had some difficulty tying knots @ end. Pins could have been bigger. Small pins are not ideal for swapping. Easy to make – love it for this Centennial Year. My Daughter is having a super time swapping it with others! Not to hard, not too easy! The girls loved it!